"Black Coffee" Susan's 2nd release on Southport Records. "People can't believe their ears!" - Oprah Winfrey - Susan May made her national TV Debut on the Oprah Winfrey Show ( The World's Most Talented Kids ) singing 'Feeling Good' from her CD "The Rose"
Susan performed LIVE on FOX TV NEWS in the Morning (Chicago) hosted by Tamron Hall and David Novarro. "Susan's singing voice, with it's 3� octave range seems to come from somewhere outside her ... intelligent and mature." CBS 2 Morning News in Chicago hosted by: Susan Carlson, Suzanne LeMignot, and Ed Curran. 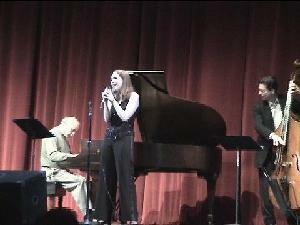 Susan performed live with Jim Ryan on the piano.